The meaning of this famous motto was inspired by Pietro Sarpi (1522-1623) who was an Italian theologian and mathematician from Venice. His last words were: "Esto perpetua", meaning: "Mayest thou (Venice) endure forever". The motto is therefore translated either as "It is perpetuated" or "It is forever". 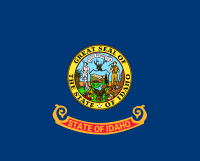 The American citizens who live in, or who come from Idaho, are referred to as Idahoans. The official nickname Gem of the Mountains is to due to its abundance of natural resources including gold, silver, copper and lead together with beautiful gemstones such as star garnets, opal, jasper, jade, topaz and tourmaline. The word 'Spud' is an informal term, or slang, for a potato which are abundant in Idaho. The origin of the term is a spade-like tool with a narrow blade that is used for digging. Little Ida is an affectionate name and alludes to the relatively small size of the region. "We, the people of the State of Idaho, grateful to Almighty God for our freedom, to secure its blessings and promote our common welfare do establish this Constitution." Official Nickname "Gem of the Mountains"